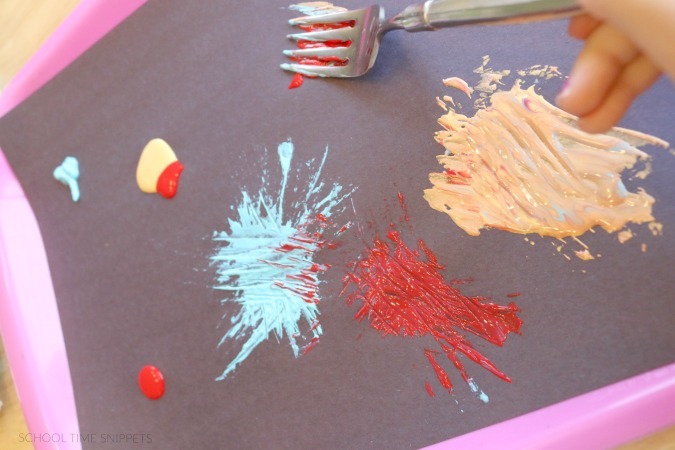 2 Simple 4th of July Crafts for Kids! Along with reading some great 4th of July books to get ready for the celebration of America's birthday, we decided to make some fun red, white, and blue crafts! There is just so much we look forward to doing during the summer months, including looking forward to having no plans! However, when I get out of our routine I almost don't know what to do with myself! It is the weirdest thing! To keep from going crazy, I planned some fun and simple crafts my son and I could make together. 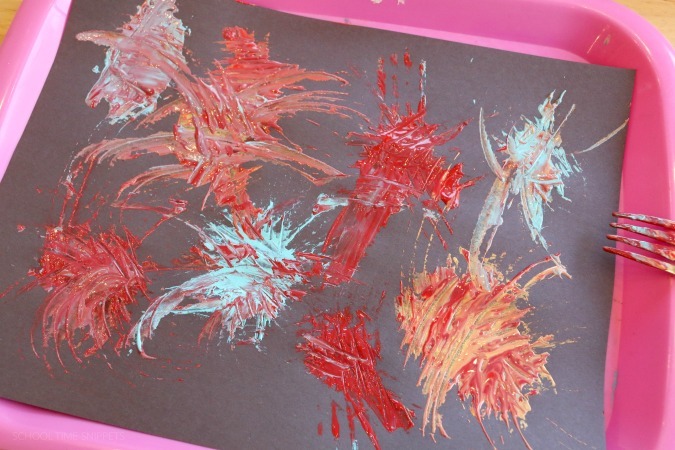 For the first craft, we made 4th of July fireworks! 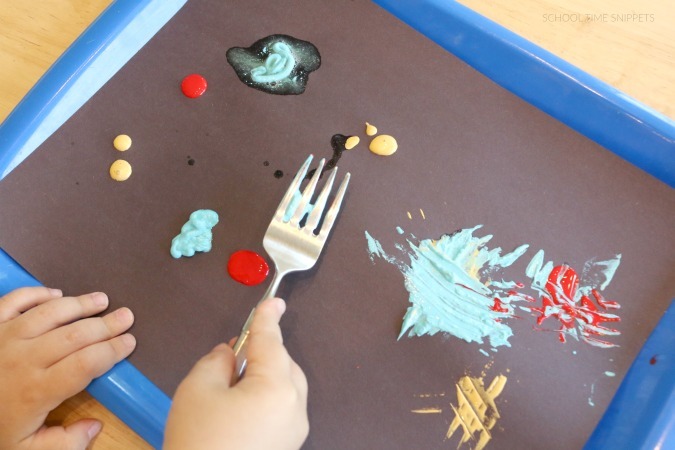 I put dots of paint all over my son's paper and with a fork, he spread the paint around to make "fireworks." We are still finding little specks of glitter every now and then! I wasn't exactly sure how this would turn out, but he and I are both pleased with our fireworks! The second craft was easy-peasy and very low mess! 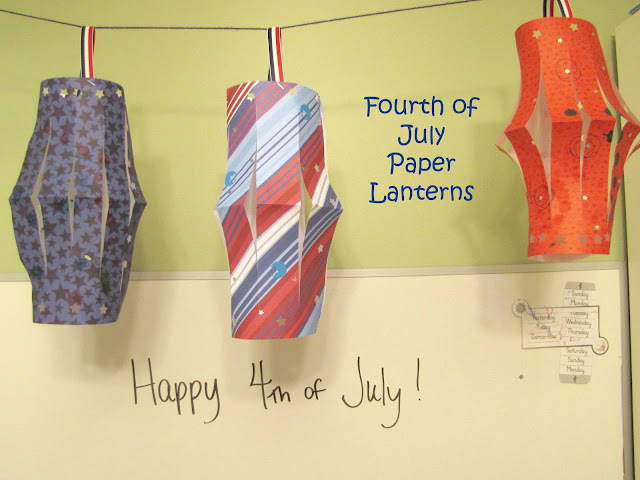 We made 4th of July themed paper lanterns. I started one paper lantern and my son later joined to decorate the other two sheets of paper I had recently purchased; have I mentioned that we are only a walk away from a craft store... I'm spoiled : ) Anyways, decorate your paper first with stickers or use a hole punch to make designs-- whatever suites your fancy! Next fold it in half, and begin to cut slits beginning at the folded edge leaving 1-2 inches (uncut) at the top. Finally staple a strip of ribbon to the top of your lantern and hang! 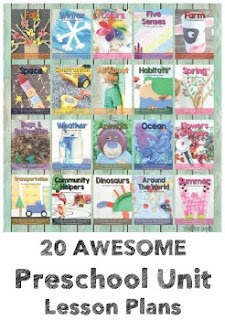 Enjoy reading some books about the 4th of July and then create these two fun and simple crafts!